A major issue for corporations today is sustainability and reducing impact on the environment. Many national and international corporations are known for being sustainable and environmentally friendly, including Hewlett-Packard, Dell, Ikea and Johnson & Johnson. But one company focusing on sustainability may surprise you: Wal-Mart. The world's largest retailer is taking several steps to reduce its impact on the environment, and Wal-Mart is doing it behind the scenes without trying to get significant recognition. The most recent company changes in this area is to add LED lighting throughout stores. Wal-Mart tested the use of LED lighting in stores in Ohio. In one store in South Euclid, LED lighting is used throughout the 181,000-square-foot facility's parking lots, signage, ceiling lighting and all refrigeration cases. The testing phase in the Ohio locations went so well, Wal-Mart is planning on expanding this concept through stores in the United States and internationally. For a small retail business with a single store in the local mall, changing the lighting to LED lighting will reduce the impact on the environment, but the cost, overall effect and resulting savings are miniscule compared to Wal-Mart's. So, what effect does the lighting change have on such a large corporation? The fixtures involved in this lighting change account for 90 percent of total lighting usage, making the impact extremely significant. The purchase of LED lighting from GE is the largest purchase to date. It will cost a large amount of money to have full LED lighting installed; however, the resulting savings make the cost completely worth the expense. Wal-Mart's LED lighting will reduce energy consumption by 40 percent for each bulb. In the United States, switching 30 locations to LED lighting will save Wal-Mart 15 percent in energy usage. In Brazil, 30 store remodels will result in a 41 percent energy savings; in China, 24 new stores and 16 remodels will result in 42 percent energy savings; and in the U.K., 10 new stores will result in 45 to 51 percent energy savings. Per store, the annual savings from this change will be around $34,000. What else has Wal-Mart done? Wal-Mart has also been producing renewable energy, purchasing green energy, incorporating the secondary-loop refrigeration system, using fly ash flooring, harvesting rainwater and improving fleet technology. Wal-Mart is a leader in renewable-energy products, and the renewable energy projects they are involved in have the ability to meet up to 60 percent of a store's energy needs. 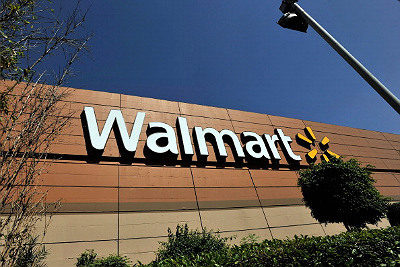 Wal-Mart has 150 solar installations in seven countries and 26 fuel-cell stations in the United States. The retailer is also testing micro-wind, large-scale wind, solar water heating and solar thermal both nationally and internationally. Another way Wal-Mart has reduced its environmental impact through renewable energy is through long-term power purchase agreements. In Mexico, more than 300 stores are supplied by Eléctrica del Valle de Mexico's wind power, providing 17 percent of Wal-Mart Mexico's energy needs. In Texas, the Duke Energy wind farm in Notrees supplies 350 stores with 15 percent of their electricity needs. In Ireland, 14 stores are supplied by wind power. As with most nationwide and international companies, transporting products is a major issue that typically results in a significant environmental impact. Wal-Mart is doing its best to reduce the impact from its fleet by pushing for a simple goal: deliver more goods, drive fewer miles. Wal-Mart has driven 295 million fewer miles and has delivered over 650 million more cases since 2007. Wal-Mart is also developing and testing new tractors that will reduce the impact from the fleet. Wal-Mart's Acres for America program aims to preserve one acre of wildlife for every acre developed. For example, Salmon Creek Forest is one of the few habitats worldwide where redwood trees exist and grow. Acres for America has helped preserve that forest, and approximately 680,000 acres of land in 25 states. The program was started in 2005 and is a 10-year commitment. The original goal was to help conserve 138,000 acres. Within recent years, the program approached 700,000 acres of conserved land — well surpassing the original goal. Eleven percent of Wal-Mart's greenhouse gas emissions came from refrigeration cases and walk-in coolers — more than the emissions from the truck fleet. In 2011, Wal-Mart became the first retailer in the United States to use a secondary-loop refrigeration system. This system cuts greenhouse gas emissions by up to 95 percent. New Wal-Mart locations will incorporate this system. Another tactic used by Wal-Mart is the cement floor mixture in new stores. Mixed in the cement are 12,677 tons of fly ash (a byproduct of coal-fired electrical generation) and 2,475 tons of slag (a byproduct of steel manufacturing). Fly ash reduces the environmental impact by reducing the need for oil — every ton of fly ash saves one barrel of imported oil. Internationally, Wal-Mart is reducing its impact by harvesting rainwater from Best Price store locations. Should other companies follow the lead and become more environmentally friendly? Many companies have already begun changing their ways to become more environmentally friendly, but many have remained stagnant due to the costs of changing their ways. However, new rules and regulations from the government could force companies to make these changes. The United States might still be working to require certain changes regarding sustainability, but internationally, things are changing quickly. Take for example Europe's new law passed April 16. In a 599-55 vote, the European Parliament passed a law requiring large companies — those with more than 500 employees — to report on sustainability. These companies must produce annual reports that address "policies, risks and results" in regards to "social, environmental and human rights impact, diversity and anticorruption policies." The cost of change is high, but the resulting savings and reduced environmental impact are worth it for many companies. It is only a matter of time before some changes will be required. Will you take the initiative, or will you wait until it is forced upon you by law?